Bold and Beautiful • Run Hard. Rest Well. When was the last time you ran smack dab into something BOLD? What about BOLD and BEAUTIFUL? That’s a bold as you get. Read it again. This truth, taken at face value, is stunning. Available to all people, at all times – means me. Now! In whatever mess I find myself in, whether of my own making or the poor choice or attitude of another. Verse 1 and 2 are a dynamic duo. Kindred spirits, united and entwined. To release the treasure of verse 1 in my life, I must be convinced, convicted and familiar with the stunning, life-altering, universal truth found in verse 2. Do I follow where he leads? Will I follow where he leads? Sometimes he leads me to external/physical places of quiet to “sit and soak” him in . . . to rest. Sometimes he leads me to internal/spiritual places of quiet to “sit and soak” in him . . . to rest. 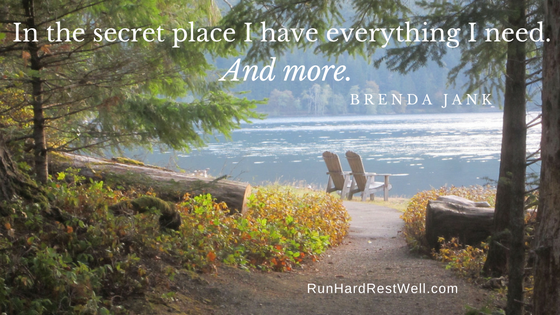 This is the secret place where I have everything I need. Yes, sometimes, not often enough. Unfortunately, too often, I allow myself to be distracted by things needed to be done. I become anxious when I have procrastinated and the deadline is now. Usually I can stop the angst when I stop and commit my project, need, struggle, to the Lord. If I lay it down, Hehelps me accomplish what is needed. Still, there can be consequences. If I listen at the beginning of my day and work according to His plan for each day, I find I have more time with Jesus, and my heart is stilled.